Female patient 19 yo, pain at epigastric area after jumping across a bar in gymnastic activities for 3 hours before admission in Medic Center. She looks pale, and could not keep body straight in walking, and feeling pain when compressing her bossom. Blood pressure: 100/70 mmHg, pulse rate:78 beats/min. 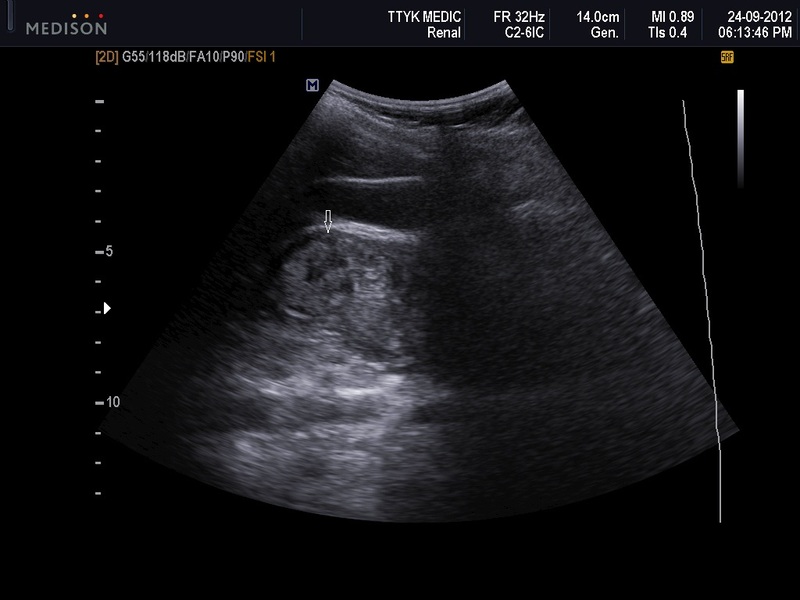 Ultrasound detects edema of wall of D2 and D3 of duodenum, thickening of 16-18mm. There is a discontinuity of serosa of D2 (arrow) which suggests of rupture of D2 . 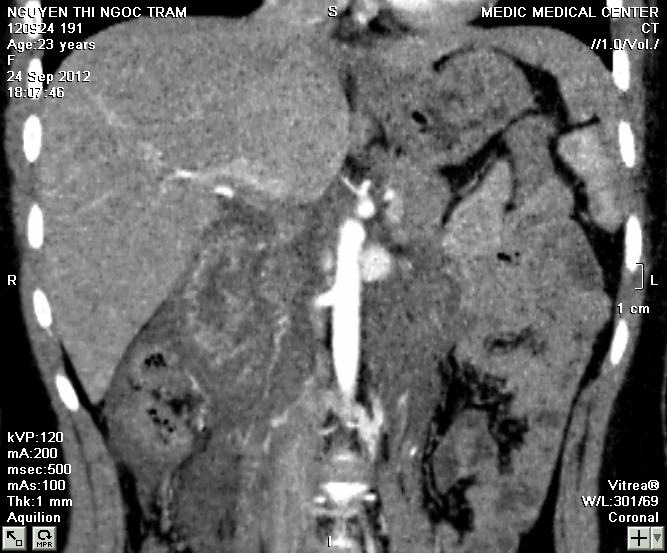 A small amount of fluid around D2 and no free air into abdominal cavity. MDCT 64 discloses thickening of duodenum wall of D2 and D3 and free fluid around duodenum, without free air in peritoneal sac. 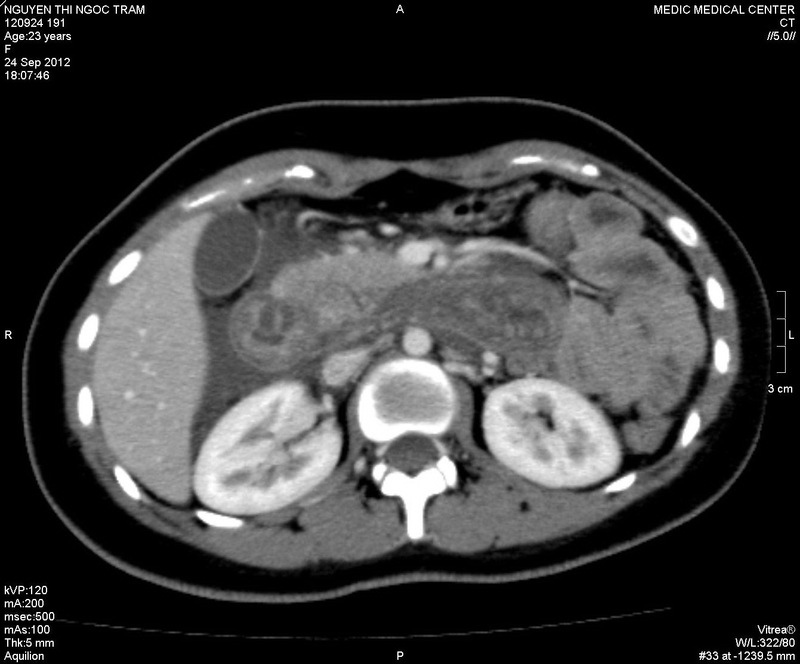 Head of pancreas is not well-limted and catching the contrast unhomogenously. Suspection of hematoma of duodenum and head of pancreas due to trauma are noted down. In emergency department of Binh dan Hospital, this case is undergoing by continuous gastric aspiration through nasogastric tube. Clinical status is in very good response, pain reduction, epigastric area no rebound tenderness. After 48 hours, gastric tube is removed, and she can drink water. 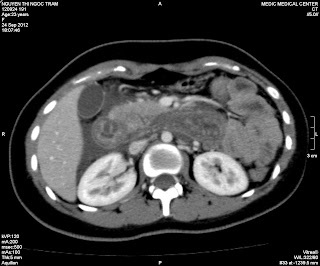 Wait for abdominal CT evaluation of conservative attempting.